It's true: I'm obsessed with gadgets and automation. 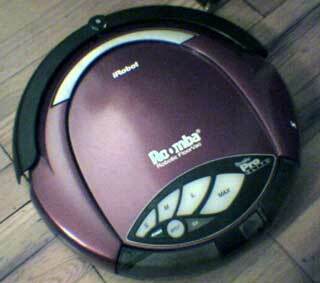 Enter our latest toy, the Roomba robotic vacuum cleaner. This little guy does a great job, going under the couch, etc. My wife is very happy, because my approach to vacuuming tended toward bumping up against things rather than actually moving anything to find the hidden dirt. Now, all that dirt that no one knew was there is also gone. The Roomba is fascinating to watch the first few times you use it. After that, you can let it go and have clean floors all the time. With two dogs, three cats, and hardwood floors, that can be quite a sneeze-reducer. See this for your yard-bot.